In Between the Covers: Verabear's Book Case: THE job a million girls would die for! THE job a million girls would die for! 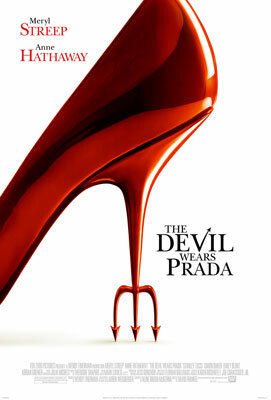 The book and the movie versions of The Devil Wears Prada , though sharing the main plot and principal characters, are independent of each other. One could already feel the difference in treatment from the beginning of the movie - the interview scene. There was no attempt to lead Andy into thinking that Miranda was the sweetest person and the greatest boss. Andy had the same job and did pretty much the same insane tasks she did in the book version. Seriously, feels like Andy (and Emily for that matter) needed a streaming supply of energy pills just to survive. I'm surprised Miranda didn't have pill-popping staff. They gave Miranda's character a redeeming feature in the movie - something she didn't get in the novel. The book Andy was constantly smoking; and her relationship with her bestfriend Lily and boyfriend Alex was more central to the story than it was portrayed in film. Movie Emily was snooty through and through whereas they had shared some moments in the book version. Ugh that writer Christian character was as yummy on paper as he was on film. But I'd prefer how Andy handled that part in the book. Just that the film version didn't give Alex a fighting chance. Perhaps maybe that's why they came up with a totally different character in Nate for the movie? I haven't read the book but I saw the movie and thought it was cute. My daughter read the book first then saw the movie and she loves the book. I might have to borrow her copy. Oh yes it would be, read it and let me know too what your thoughts are :) Thanks for visiting!